This splendid elbow wedding veil may be just the perfect finishing touch! 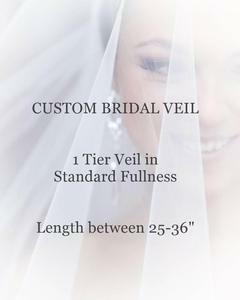 As pictured the veil features our standard cut, with a plain/cut edging. It is cut from 72" wide material - so it is a bit fuller than veils cut from 54" material. The length, edging, and embellishments for the elbow wedding veil can be customized to fit your desires.